According to the London Daily Mail, Dr. Michael Prager is warning against jobs where women spend long hours in front of a computer screen. Apparently, it leads to saggy jowls, “turkey neck,” and deep wrinkles on the forehead and around the eyes. Collectively, the Botox specialist is calling this “computer face” and saying he sees this early signs of aging most in women who work in an office. He’s trying to pad his wallet and convince more people to get plastic surgery. Looking at a computer screen doesn’t give you turkey neck anymore than reading a book does or going for a walk. Interesting. Do you believe it? 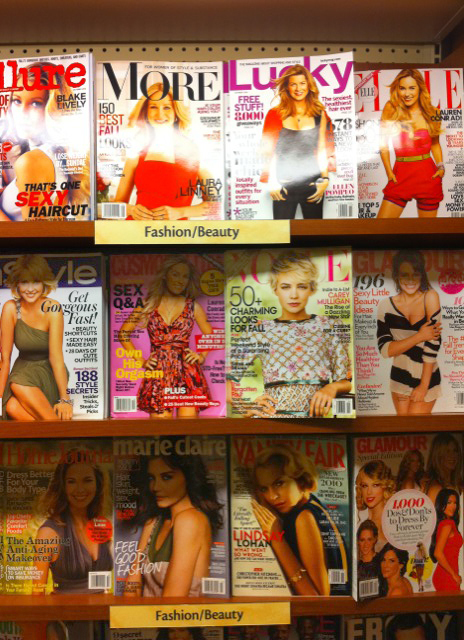 Ever notice magazine covers all look EXACTLY the same? Now, to the average reader of any of these, I’m sure they would say “no way, they look totally different!” After all, the content of each is (slightly) different and the audiences are different, too. But imagine if you had never seen a magazine before and wanted to buy your first one. Which would you choose? Why? Haven’t these magazines ever heard of the Purple Cow? Seth Godin’s book says “Transform your business by being remarkable.” There’s nothing remarkable about these magazines – they’re the same as the others, and they’re the same every month. (Doesn’t it seem like Cosmopolitan always has 77 new ways to “blow his mind”?) Typically, if you’re going to buy one it’s because you’ve read it before and/or the celebrity on the cover compelled you to buy it. The articles certainly aren’t much different, and the style/look of the cover certainly isn’t, either. Imagine you’ve never read any magazine before. You’re an alien from outer space, or you’re Amish, or something… and this is your first time in a supermarket. What is going to make you choose one and not the other? Dare to be different, designers. Fortune favors the bold.